What sets this book apart from previous works is that interested readers can find all they are likely to need to know in this single volume. 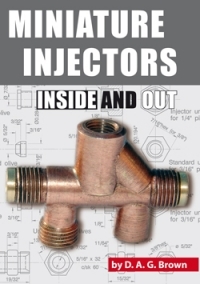 The author begins by describing the operation and development of the injector. From here we learn how to determine a suitable delivery rate and are led step by step through all the details of manufacture adopted by the author. Copiously illustrated with fully dimensioned drawings and photographs taken in the author’s own workshop, it is unlikely that anyone who chooses to make their own injectors will be at a loss for clear information. Invaluable sections of this book not encountered elsewhere – at least not in such detail – are the author’s notes on fault finding and their cure, servicing and maintenance. Owners experiencing the frustration of a temperamental injector need look no further than these pages to discover how to introduce reliability and thereby peace of mind to activities on the track or rally field. The author finishes with a chapter on building his popular four-facet small drill sharpening device originally published in Model Engineer magazine.